Smartphones take great stills and video. But in bright daylight with the sun shining on the screen it is difficult if not impossible to clearly see what you are shooting. A sun shade for smartphones would be a help but I can’t find any made for photography (there are some for GPS and drone control devices). The smartphone screen is clearly visible in bright sunlight with the simple cardboard sun shade. With HandlePod and a Smartphone Tripod Mount you can create a smartphone sun shade in a couple of minutes for pennies or no cost at all! You just need cardboard or thick paper, preferably black, and some scissors. If you don’t have black paper or cardboard you can spray paint it black later. The DIY smartphone sunshade is simple to make with black cardboard. Cut a three-inch wide length and trim it so that it totals the width of the phone held horizontally plus two times its height (example a phone 6 inches wide and 3 inches high would be 6+3+3=12).Center the phone on the strip and mark both sides. With a knife or blade score the cardboard along the marks. Be careful not to cut all the way through. Then fold both ends over and press. If you are using black paper just mark and fold it. I used black mounting board for a more solid construction. It’s that simple. Attach the sun shade by pressing it against the top bracket of the tripod mount so that it slips between the metal bracket bars and the plastic frame. Insert the phone Insert the phone so that the top touches the sun shade then press the bottom of the phone into the bottom mount bracket. The phone and the sun shade are now held firmly in place by the tripod mount. The screen is shaded from direct sun and is much easier to see. And screen controls are easily accessible from below the shade. 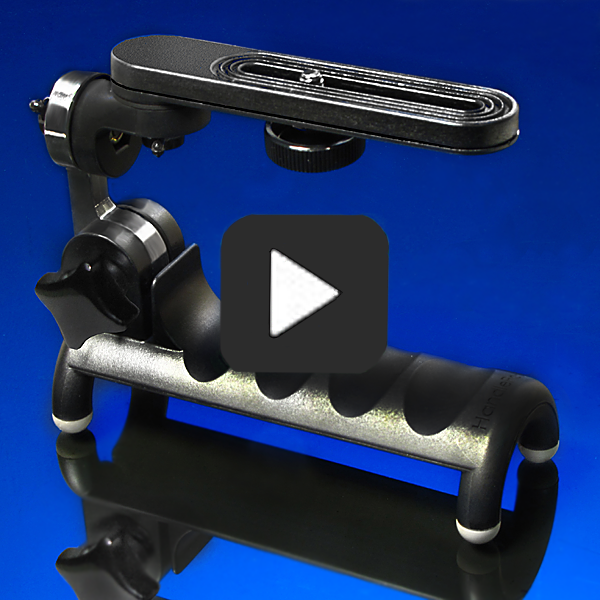 The HandlePod provides a firm grip for both hands without having to touch the phone. Your video will be rock steady and shake free. And you can shoot stills or video in sunlight while viewing the screen much more clearly. Indoors or out of the sun when you don’t need the shade, it comes off quickly, folds flat and slips in a pocket. HandlePod and the Smartphone Tripod Mount give you stable, shake free video and a simple, no-cost way to shade your phone screen in bright sun for better visibility. This entry was posted in Tripod Alternative on May 19, 2015 by main user.